This has to be my favourite time of the year for shooting insects, and last weekend, conditions were absolutely perfect for pursuing insects. At this time of year, when the weather is warm early in the morning, the insect life is abundant from breakfast time to late evening, and is a dream for a keen macro photographer like myself. There are almost too many subjects to chase! 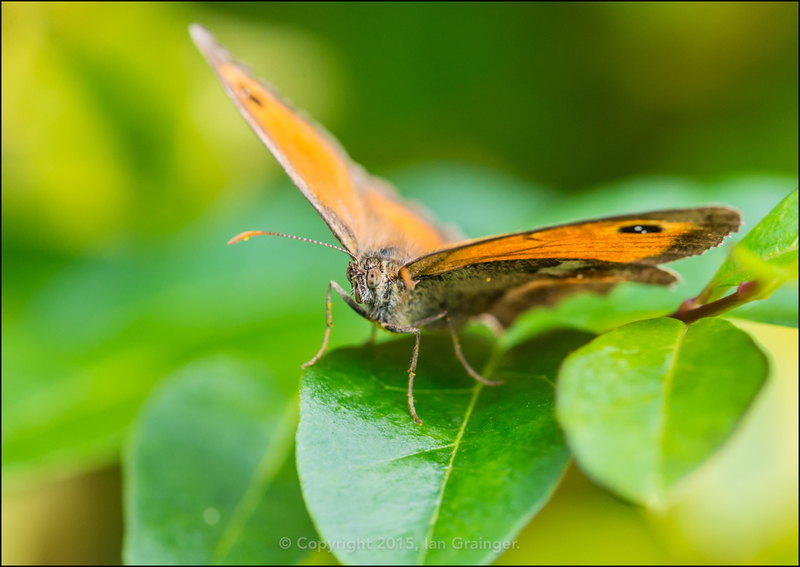 At the weekend there were copious numbers of these small Gatekeeper (Pyronia tithonus) butterflies, which were absolutely loving the ragwort blooms that had been left to grow in a corner of the garden. This particular specimen was taking a break from collecting pollen, and resting amongst the lavish green leaves of a camellia bush, allowing me to get in quite close for a few quick snaps.